Tickethunteronline.com announces that they have discounted ticket prices for all Billy Joel nationwide dates. Fans can get the discount by using promo code "wicked" at checkout. 20% discount at check out with promo code "wicked". Tickethunteronline.com announces that they have discounted prices for all 2014 Billy Joel tickets including the Hollywood Bowl. Billy Joel will be coming to the following cities in the near future: New York, Los Angeles, Boston, Milwaukee, Houston, Minneapolis, Kansas City, Little Rock & Oklahoma City. The Los Angeles-based ticket seller offers a 20% discount at check out with promo code "wicked". Billy Joel Hollywood Bowl tickets are selling fast but you can still reserve yours and see the spectacular performance of a living legend. 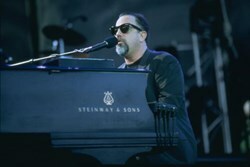 Born on May 9, 1949, in New York, Billy Joel bounced back after a disappointing first album, Cold Spring Harbor (1971), with 1973's Piano Man, featuring hits like "Piano Man" and "Captain Jack." He went on to make successful albums like Streetlife Serenade (1974), The Stranger (1977) and 52nd Street (1978). Other Broadway incentives include discount Book of Mormon tickets. TicketHunterOnline is the source for all of the entertainment needs. TicketHunterOnline.com is a discount ticket sales and event promotions company. Producing over 200 live events each year, ticket hunter remains the premiere destination for live entertainment. Ticket Hunter partner's with the leading ticket distribution companies across the globe, allowing access to the top events at the best prices. TicketHunterOnline.com is your online source to great seats at competitive prices for all sports and entertainment events in the US and Canada. We pride ourselves on delivering a full range of seating options at the lowest prices ever seen.